What a simple card and I think this was everyone's favorite...simple and elegant. 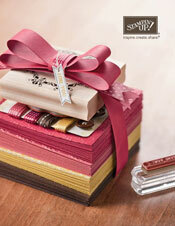 The background uses the Stripes Embossing Folder, FREE with a qualifying SAB order. 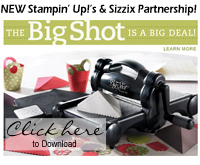 The stamp is from Sprinkled Expressions, also a SAB item. The curly label is made using the new framelits - MOST HAVE item! Over the next few days, I will be sharing with you the cards we did at my recent stamp-a-stack. This card uses Fresh Vintage stamps and Poppy Parade. The button is from the Everyday Enchantment Ribbon & Brad pack. Another typewriter card. Ironically, my kids have never even seen a typewriter, boy does that make me feel old! The DSP was cut using the edgelits. This was easy. Once you cut one side, take the cut piece of DSP and dotto it to the other side of the edge you want to cut. Follow that pattern to make sure they are symmetrical. It is easier than I described it! I was not going to buy this stampset but after seeing cute stuff made with it, my resistance was low. I don't use my fabric as much as I should. I like tearing it for a project like this. This would make a cute birthday or valentine card (change the sentiment). My original punch style fits into this wall holder my husband built for me. Wouldn't you know, SU changes the punch style. I have a mix now, and I am fine with that. My 12 x 12 DSP will not fit into the filing cabinet so I store it in the cabinets on the wall. I have TONS of DSP. I like to have a choice! Well, I hope you have enjoyed my stamp room. It is working for me right now. I setup tables in the adjoining room for most of my classes. If the number gets too big, I use my formal dining room and eat-in kitchen downstairs. I just have to run upstairs to get the stuff I forgot to bring down...so you know I get my exercise. I store my loved embossing folders and the new framelits in this kitty. I needed some storage for my Big Shot dies and found this cool painted cabinet. The Big Shot lives on top, and all the dies are inside. I store some of my punches in there too. Samples of cards are on the SU card holder and I also found the wrought iron ones for the wall. I bought a curtain for the window, just something to add some interest and keep the window from looking so bare. In the summertime, the shade is up more because the view is fabulous...the pool is open and it looks so inviting. Look how clean the top of the desk is. That won't last long! I keep all the scissors, pens, blender pens, etc in alum cans and there is another lazy-susan with adhesive, stazon, daubers, current minis...just within reach. Behind the desk is a credenza filled with ribbon and ink pads. AND of course, my ipod player. On the days I work from home, it is torture to be on conference calls instead of stamping. Ok, I finally finished cleaning up this mess. Over the next few days, I will share my stamproom/office with you. I wish it were bigger, but at least I have a place. The cabinets against the wall contain DSP, background stamps, reference materials, wheels, and various other stamping supplies. The drawers are packed with some clear and wood stamp sets, plastic bags, adhesives, embossing powders, and office supplies. I have a basket that holds all my SU fabric, and a basket with current mini catalog stuff to play with (spritz paint, tags, waffle paper, etc). Brads and buttons are stored on the round SU lazy-susans. I got these for free with my rewards points. Don't think we sell these anymore. I made this gigantic bird lolly and hung it on the cabinet door. When I was at Pier 1, I saw the Eiffel tower wall plaque and knew I had to have it. It is really a photo/card holder. Note to self: make something with Artistic Etchings to hang on here!